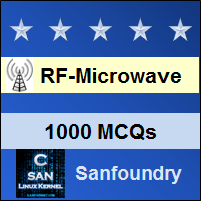 This set of Microwave Engineering Multiple Choice Questions & Answers (MCQs) focuses on “Monolithic Microwave Integrated Circuits”. 1. Progress in ________ and other related semiconductors material processing led to the feasibility of monolithic microwave integrated circuits. Explanation: Progress in GaAs and other related semiconductor material processing led to the feasibility of MMIC, where all the passive and active components required for a given circuit can be grown or implanted in a substrate. 2. MMICs are high cost devices that involve complex fabrication methods and contain multiple layers to contain even small circuits. Explanation: Min MIC can be made at low cost because the labor involved with fabricating hybrid MIC’s is reduced. In addition, a single wafer can contain a large number of circuits, all of which can be processed and fabricated simultaneously. 3. The substrate of an MMIC must be a _____________ to accommodate the fabrication of all the type of devices. Explanation: Substrate of MMIC must be a semiconductor material to accommodate the fabrication of active devices. The type of devices and the frequency range dictate the type of substrate material. One such material is GaAs MESFET. Explanation: GaAs MESFET find application in low noise amplifiers, high gain amplifiers, broadband amplifiers, mixers, oscillators, phase shifters, and switches. These are the mostly used and cost effective substrates. Explanation: Transmission lines and conductors at microwave operation are usually made with gold metallization. To improve the adhesion of gold to the substrate, a thin layer of chromium or titanium may be deposited first since these metals are relatively lossy. Explanation: Capacitor and overlaying lines require insulating dielectric films, such as SiO, SiO2, SiN4 and Ta2O5. These materials have high dielectric constants and low loss and are compatible with integrated circuit processing. 7. Resistors used at normal operating frequencies can be directly used at microwave frequencies in MMIc. Explanation: Resistors used at normal operating frequencies cannot be used directly in MMICs. Resistors require the deposition of the lossy films like NiCr, Ta, Ti, and doped GaAs commonly used. Explanation: Processing begins by forming an active layer in the semiconductor substrate for the necessary active devices. This is done by ion implantation or epitaxial techniques. 9. MMICs are the best microwave integrated circuit fabrication methodologies without any drawbacks in it. Explanation: Major drawback of MMIC is that they tend to waste large area of relatively expensive semiconductor substrate for components such as transmission lines and hybrids. 10. MMICs have higher circuit flexibility as compared to other microwave integrated fabrication methods. Explanation: Since the fabrication of additional FETs in an MMIC design is much easy, the circuit flexibility and performance can be enhanced with only little additional cost and the requirement for the fabrication of the entire device is prevented.